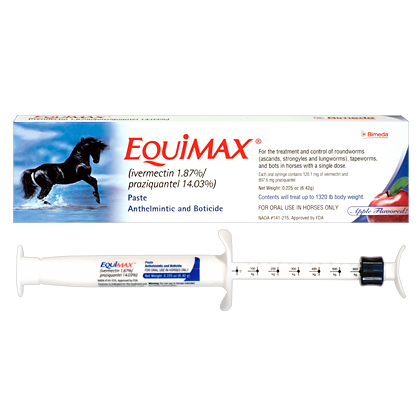 EQUIMAX is an FDA-approved, all-in-one dewormer that combines ivermectin and praziquantel to safely and effectively rid horses of all major internal parasites, including tapeworms, in a single dose. EQUIMAX combines ivermectin and praziquantel. Ivermectin works by disrupting nerve impulses in parasites. It binds to glutamate-gated chloride ion channels which occur in invertebrate nerve and muscle cells which leads to an increase in the permeability of the cell membrane, thereby paralyzing and killing the invaders. Praziquantel works by damaging the parasite's skin internally so the parasite disintegrates and is removed by the horse's immune system. EQUIMAX should not be used in animals other than horses and ponies, as severe adverse reactions, including fatalities in dogs, may occur. Ivermectin and excreted ivermectin residues may adversely affect aquatic organisms. Do not contaminate ground or surface water. Dispose of the syringe in an approved landfill or by incineration. Equimax is an FDA approved, all in one dewormer that combines ivermectin and praziquantel to safely and effectively rid horses of all major parasites, including tapeworms, in a single dose. Equimax Paste is a non-prescription (OTC) product. The content of a single oral syringe is sufficient to treat horses up to 1,320 lbs at the recommended dose rate of 91mcg per lb. Each weight marking on the oral syringe plunger delivers enough paste to treat 220 lb of body weight. All horses should be included in a regular parasite control program with particular attention being paid to mares (including pregnant mares at any stage of pregnancy), foals and yearlings. Foals should be treated initially at 4 weeks of age, and routine treatment repeated as appropriate. Equimax Paste effectively controls gastrointestinal nematodes and bots of horses. Regular treatment will reduce the chance of colic caused by the tapeworm A. perfoliata and verminous arteritis caused by S. Vulgaris. Swelling and itching reactions after treatment with Equimax Paste have occurred in horses carrying heavy infections of neck threadworm. These reactions were most likely the result of microfilariae dying in large numbers. Symptomatic treatment may be advisable. Healing of summer sores involving extensive tissue changes may require other appropriate therapy in conjunction with treatment with Equimax Paste. Reinfection, and measures for its prevention, should also be considered. Consult your veterinarian if the condition does not improve. Equimax Paste is for use in horses and ponies only. This product should not be used in other animal species as severe adverse reactions, including fatalities in dogs, may result. Do not use in horses intended for food purposes. This product is not intended for use in humans. Do not smoke or eat when handling this product. Wash hands after use. Avoid contact with eyes. Do not contaminate ground or surface water. Dispose of the syringe in an approved landfill or by incineration. Store this product at room temperature. Keep out of the reach of children and animals. Equimax Paste is an all-in-one dewormer that combines ivermectin and praziquantel to safely and effectively rid horses of all major internal parasites, including tapeworms, in a single dose. All horses should be included in a regular parasite control program with particular attention being paid to pregnant mares, foals (over 4 weeks of age), and yearlings. Equimax Paste is safe for use in pregnant mares, breeding stallions, and foals over 4 weeks of age. Do not smoke or eat while handling this product. Wash your hands after use. Do not use in horses intended for food.